There have been many clones of vintage Big Muffs made throughout the years and many pedals that were inspired by the Big Muff four stage circuit. Some are basically exact copies of particular Big Muff circuit and others feature unique modifications and improvements. Here are reviews of a few of my favorites. You won't find reviews here of any clones that are not well made, or that do not sound good. If I do not like a pedal, I simply don't review it. There are many good clones that I have not reviewed yet, so just becasue it is not here does not mean it is not any good. BYOC Large Beaver- One of the most inexpensive vintage Big Muff clones. Comes as a kit from BYOC (Build Your Own Clone) Effects with all parts that you assemble yourself, or it can be bought pre-built from Axe and You Shall Receive. Includes parts to build both a Ram's Head or Traingle version. The Triangle Beaver has slightly more sustain, bottom end, and sounds smoother than the Ram's Head, and the Ram's Head has a slightly darker scooped mids tone, and more grit and dirt. I like the Triangle spec version best, but in some settings the two pedals sound very similar. The Beaver includes a four position knob that lets you use the stock scooped mids Big Muff setting, and two different mids boost settings. The mids boost is critical for some Muff users who cannot seem to get the stock mids scooped tone to work in their band mix. A fourth position lets you completely bypass the tone circuit, the same "tone bypass" feature found on some the the late 1970s Big Muffs and the Tone Wicker Muff. This EQ selection makes for a very usefull Big Muff. I wish more Muff clones had this feature. Do these sound like clones of the real thing? That's very subjective since the real V1 and V2 Big Muffs varied in component values and types, and most importantly, varied in sound quite a lot from unit to unit. Nothing really defines a Triangle Big Muff from a Ram's Head other than the box they are in. There were as many versions of the circuit in the one box as the other. The Beavers have a similar sound to vintage Big Muffs, but they have a more modern sound when I compared them to examples of real vintage Big Muffs I own. I have been asked what transistors are in the BYOC and how they compare to the older transistors used in the originals. First, I have to point out that the values of the capacitors and resistors have far more affect on the sound than the transistors. They sculpt the sound fed into the transistors. That said, some transistors are better than others, but they are by no means what "makes" the sound. BYOC used 2N5088 transistors, then 2N5133 were used briefly around 2007, then they switched to BC239 at of the time of this review. FS36999, 2N5133, 2N5088, or BC239's were among transistors used in the originals. They just don't make them like they used to back then, but again, transistors are only part of the sound. Even though the Beavers do not sound exactly like any vintage specimen I own, they do sound good, and have a much more versatile tone range than modern Electro-Harmonix Big Muffs. The Ram's Head spec Beaver actually has identical component values to one of my original mid 1970's Big Muffs, but it only sound about 85% the same. But, that could be said about any of the vintage 1970's Big Muffs in my collection when comparing to any other vintage BMP! I was asked how they compare to high end Pete Cornish Big Muff clones like the P-1 and P-2. In the standard scooped mids position (first position on the knob), with the sustain around 75% or over, the RH spec Beaver sounds somewhat similar to a Pete Cornish P-1, but so do other Muff clones like the Top Tone DG-1. In mids boost position 1 (second position on the knob), with the sustain around 75% or over, the RH spec Beaver sounds practically identical to a Pete Cornish P-2. There are other differences though. See my P-1 and P-2 reviews below. The BYOC comes in an unfinished enclosure (pictured above are photos of each version that I have customized with Pink Floyd graphics). I highly recommend this pedal for anyone who wants something semi-vintage sounding without paying the price for a vintage pedal. These get very close to the sound of a many typical V1 or V2 vintage Big Muffs, but they do lack the richness in tone from some of the better vintage examples I have played. Still, these sound very nice considering they are made with common parts, and are among the best "boutique" Big Muff replicas, and most versatile. I paid about $130 for one in 2006, pre-assembled, then built one myself not long after. The instructions are easy to follow, and I recommend building any BYOC kit as a starter for anyone interested in getting into soldering and building their own pedals. Large Beaver Triangle sound clip - EQ position 1 - Pink Floyd's Comfortably Numb solo. Fender Strat with Boss CE-2 chorus and TC Nova delay into a Twin Reverb. Large Beaver Ram's Head sound clip - EQ position 1 - Pink Floyd's Comfortably Numb solo. Fender Strat with Boss CE-2 chorus and TC Nova delay into a Twin Reverb. Large Beaver Ram's Head sound clip - EQ position 2 mid boost - Pink Floyd's Comfortably Numb solo. Fender Strat with Boss CE-2 chorus and TC Nova delay into a Twin Reverb. Here are clips comparing the Beaver to some other similar Muff clones. Strat with Seymour Duncan SSL-5 bridge pickup into a clean Fender Twin Reverb. Pedal settings shown below. Review written in 2008. Updated in 2009 and 2010. The G-2 is a Silicon transistor Big Muff style circuit with Germanium diodes. Petes unique tone circuit makes it sound great at any setting, and an input/output buffer boosts the output lost by the diodes. Pete has really done wonders to the Muff circuit, as this sounds NOTHING like a Big Muff. At low sustain settings it has a warm fuzz face like overdive quality to the tone. With the sustain on full the G-2 is very much like Marshall amp on full volume mixed with the tone of a ProCo Rat pedal. With the sustain on very low- around 5-10% - and the tone knob completely clockwise, the G-2 turns into a nice light overdrive pedal. This setting can also be used to boost/blend with a Big Muff, adding the G-2's warmth to any Muff tone. I also find this an excellent pedal for most 1970s rock tones that I like. It is very quiet, even with the gain maxed. It has a similar quality to a Tube Driver at full gain. It sounds great with slightly dirty amps. The only drawback that I have found with clean amps is that even at maximum sustain, the gain is not very high. Since I prefer slightly more sustain for leads, I often boost the gain of my Big Muffs with a driver pedal or compressor, so it is not really an issue. 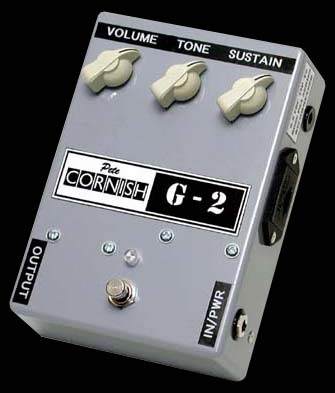 Overall, this is an excellent Cornish pedal. Highly recommended. Many of the cloners of this pedal have had a very difficult time getting them to sound like Pete's original pedal. No one seems to have figured out exactly what Germanium diodes Pete used, and many simply change them to Silicon as in a normal Big Muff, but they don't quite have the same sound. One close clone is the TopTone DG-2, that does have more gain, but that is also a very expensive pedal. The G-2 comes in Pete's standard heavy duty enclosure with a cool pop out 9v battery tray on the side, AC jack, daylight LED, improved power supply, and Pete's high quality buffering system which supposedly drives the signal of everything else in the chain after it, giving long pedal chains a slightly better fidelity. The pedal runs through the unity gain buffer in bypass mode. I have found that running the G-2 in the middle of my large pedal board does seem to reduce the minor treble loss. Although this pedal was built for Lou Reed, it seems to have become known as a David Gilmour (of Pink Floyd) pedal. The G-2 was built into several of the pedal boards Pete Cornish built for David, most prominently the one used for his 2006 On an Island tour and Live in Gdansk concert video. Although the Gilmour association has been played up, the G-2 probably saw little to no actual use by Gilmour on that tour. Other than the P-1 and a triangle Big Muff that were used on a few songs, most of the distortion solos from that tour and the DVD/CD releases were very likely David's Tube Driver with a compressor, through his Hiwatt. David has said the Tube Driver is his favored pedal, and his gear tech Phil Taylor said that David almost never used the Cornish pedals, they were just alternatives to his favorites. I have nearly all of the same pedlals used on that tour and have extensively tested them through a Hiwatt using David's settings. 90% of the high gain solos sound exactly like the Tube Driver, not the G-2. However, based on the sound of David's solos from the 2005 Pink Floyd reunion performance for Live 8, it does seem that he did used the pedal on that occasion. You can get a similar Gilmourish high gain Tube Driver sound like the OAI tour by running the G-2 at maximum distortion along with a hot compressor with a gain knob or gain trim pot to boost the distortion, like the Demeter Compulator. G-2 Sound Clip #1 - Pink Floyd's Comfortably Numb solo. Fender Strat with Boss CE-2 chorus and TC Nova delay into a Twin Reverb. G-2_Sound Clip #5 - Increasing sustain. Shine on You Crazy Diamond. Pete Cornish P-1 - A modified custom version of the V2 Big Muff, or "Ram's Head" as it is nicknamed, made by Pete Cornish. Although Pete does not like to call what he makes clones, the P-1 is very much an Electro-Harmonix Big Muff circuit at its core, and one of the best. Pete also made a different version in 1982 with a smoother tone control and less mids scoop, called the P-2. The P-1 is very rare and very expensive. Sort of the Ferrari of Big Muffs. It was originally made for David Gilmour of Pink Floyd in 1976, called the Custom Fuzz, also sometimes referred to as the Cornish Fuzz. 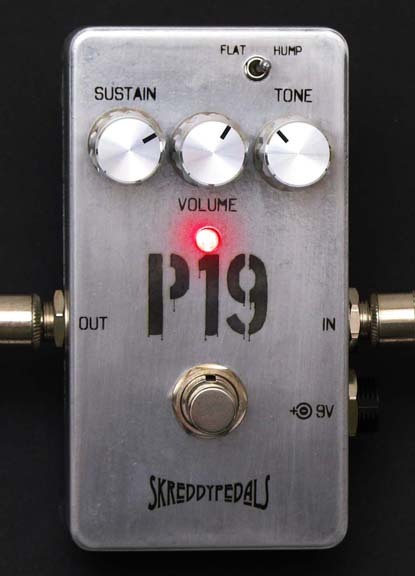 Pete renamed it P-1 in 2006 to fit in with his subsequent pedal naming nomenclature. Pete calls his later version, the P-2, a superior pedal to this, but I actually like the P-1 better. It all depends on what tone you are looking for. This is a very high quality, road worthy Big Muff. 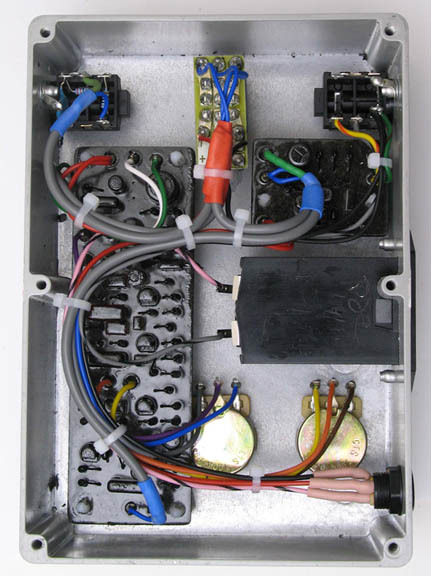 According to Pete, around 1974 or 1975 he was sent seven of David Gilmour's Big Muff pedals, of various ages and types, and asked to select the one he (Pete) considered to be the best to reproduce, but with the following improvements: add power supply de-coupling, add input/output double buffers to maintain a constant high impedance signal, and to improve the reliability and reduce PCB size, using the best components that were available at the time. Phil Taylor, David's gear tech, has said the P-1 sounds identical to the original V2 Big Muff he gave to David in 1974, the one David has used the most. 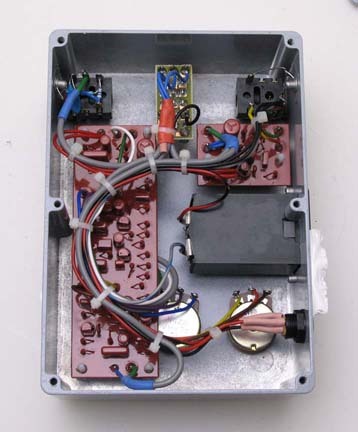 Pete built this "Custom Fuzz" into David's "Animals" touring pedal board in 1977. It was likely one of the first boutique hamd-made Big Muffs ever built. In 2006 Pete made pedal versions of the Custom Fuzz for several customers, simply labeleing it "Custom Design" on the case. It was built in a sturdier enclosure than a stock Big Muff, perfect for the hard life of a touring musician's gear. 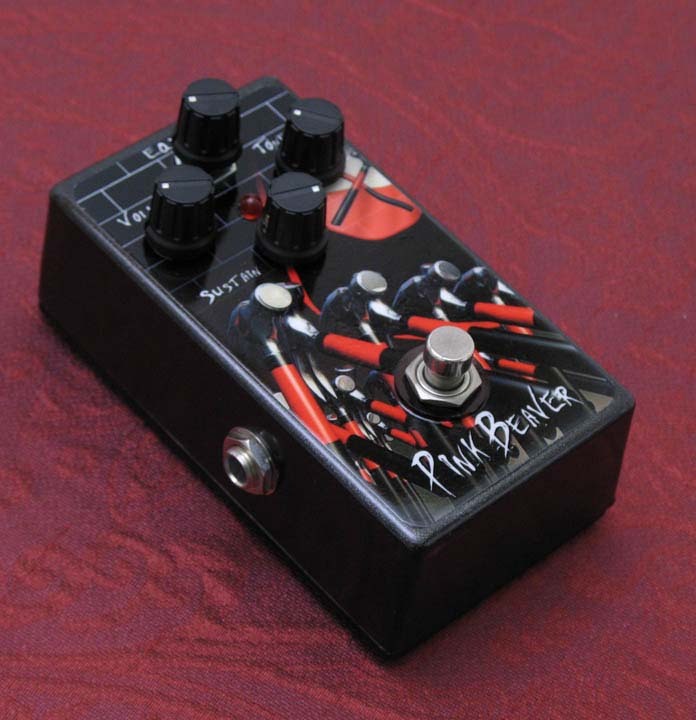 Pete made another custom run of the stand alone pedal version around 2008, officially naming the pedal the P-1. There were only 10 in that run, each with a serial number beginning with LEP-1. Later runs were made, each with a serial number beginning with LRP-1. Since it supposedly used circuit components that were difficult to source, and Pete's regular client workload got priority, runs were very short and the wait list was over 1 year. 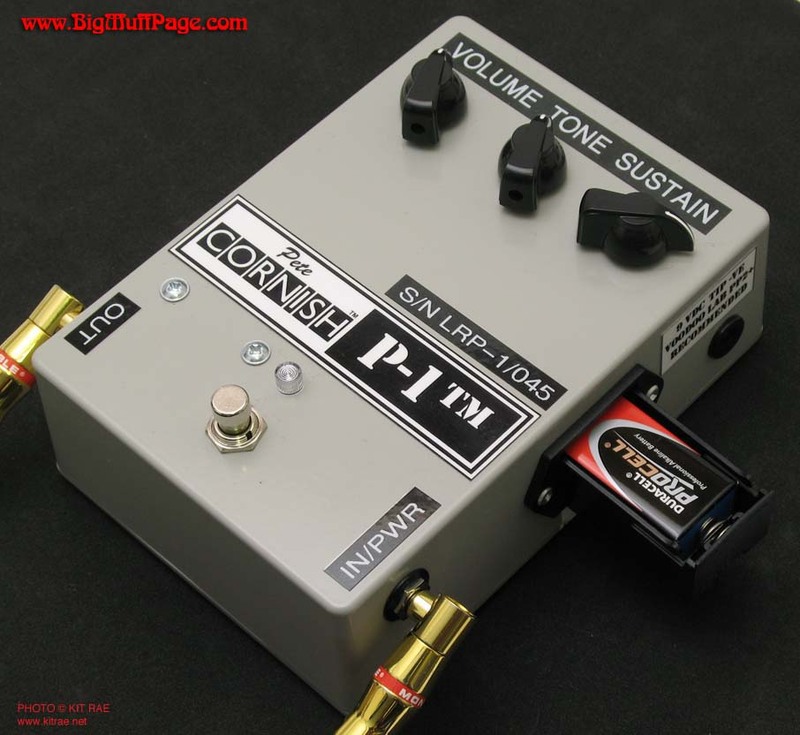 Around 2013 the P-1 was added to the regular Pete Cornish effects pedal line. A "battery-free" version in a smaller enclosure was also offered later. The P-1 is a very articulate sounding Ram's Head in that it has a nice clarity, a thick sound, but not as bassy and thick as most Ram's Head Big Muffs. Maybe a hint more mids than usual for a mids scooped Ram's Head. It has some dirt and wildness too it, but it is actually a bit more tame than some of my favorite Ram's Heads, though a bit wilder than most average Muffs I have owned. Tone is mids scooped like a typical Big Muff, but nicely balanced. The noise level is about average for a V2 Big Muff or clone. Only a few V2 Muffs I have played really stood out as exceptional in clarity and tone over the others, and I would put this in that category. It works incredibly well for solos. For wall-of-sound chords and heavier playing, the P-1 is more on the bright, thin side, rather than the dark and bassy side for a Big Muff. Using my favorite and most Gilmourish sounding Ram's Head Muff as a benchmark, this is about 95% the same. For reference, a BYOC Large Beaver Ram's Head clone is about 80-85% the same with the standard EQ switch setting. The P-1 has a tad more mids and stays fairly bright and clear, even when you go to the bass side of the tone knob. Most V2 Muffs go very flat and muffled in this area, so Pete may have modified the tone section of the circuit. Comparing the P-1 to real vintage Big Muffs, the P-1 seems to sound closest to the "violet" schematic Ram's Head Big Muff. I get asked a lot to give my opinion of whuch Big Muff clone sounds the closest to the P-1, for those not fortunate enough to be able to buy the real thing. The following clones fall into a similar sound range as the P-1: SUF '76, Ram's Head, SUF VRH, SUF '73 Ram's Head, Skreddy Mayo, BYOC Large Beaver (RH version), MJM Foxey Fuzz, and the TopTone DG-1. The VRH and DG-1 seem to be the closest, but the VRH is a bit too bottom heavy a fuzzy on low notes. There is something right there in the middle that stands out and gives the P-1 more clarity and punch. It's a characteristic many of my vintage Big Muffs have that the clones don't. Overall, the closest feel and sound to playing the P-1 is the TopTone DG-1. It has a less scooped mid range than the P-1 though, but even with that, it's the best match. The DG-1 is supposed to be inspired by the Cornish P-2, but my DG-1 falls somewhere right in between the P-1 and P-2 sound. The P-1 comes in Pete's standard heavy duty enclosure with pop out 9v battery tray on the side, AC jack, daylight LED, improved power supply, and Pete's double buffering system. Thanks go to Sage from the Gilmour Gear Forum for loaning me his P-1 to review, casusing me to order one of my own! P-1 TONE DEMOS BY FRÉDÉRIC PEYNET - Here are some excellent clips comparing the P-1 to the P-2 tone using an EMG Strat and a BadCat Mini amplifier by Frédérick Peynet (Deck from the Gilmour Gear Forum). Strat with Seymour Duncan SSL-5 bridge pickup, P-1, P-2, CE-2 and BK Butler Tube Driver when needed, and T-Rex Replica delay. PETE CORNISH PEDAL COMPARISONS - Here are clips comparisng the Cornish P-1, P-2, and G-2, using the settings shown above. Strat with SSL-5 bridge pickup and CS'69 neck pickup into a Fender Twin Reverb. More Gilmour Licks - P1, P2, G2. Bridge pickup. Chords - P1, P2, G2. Bridge pickup. Tone Pot Sweep - P1, P2, G2. Bridge pickup. Pete Cornish P-2 - A modified version of the Big Muff with a smooth tone and nice flat mids, made by Pete Cornish. Very rare and very expensive pedal, built for hard use on the road. 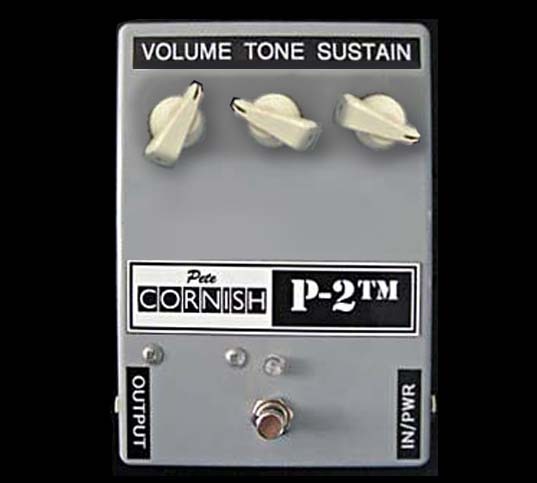 The P-2 was originally created in 1982 as an improved version of Pete's P-1 and called the Precision Fuzz. It was used in David Gilmour's 1988 and 1994 Pink Floyd touring rigs, and in 1992 or '93 Lou Reed started using one. To my ears, the P-2 is a mix of the better parts of both a V2 Ram's Head Big Muff and a V9 Civil War Big Muff, with a more usable tone control. It stands out in a band mix easily. Pete considers this superior to his P-1 likely for that reason, though I prefer the darker sounding P-1. Compared to the P-1 I reviewed above, the P-2 is considerably smoother sounding, with less mids scoop, and a bit fatter when the tone is dialed on the bass side. The treble side of the tone control is completely different from the P-2 or a typical Big Muff however. The mid range increases the higher it is dialed, rather than increasing the harsh treble of a typical Big Muff tone circuit. This allows all tones on the treble side to be useful, even when dilaed completely clockwise. It is very similar to the P-1 in all other respects. This pedal is also very similar to the sound of a BYOC Large Beaver (Ram's Head spec) switched to mids position 1 (flat mids). Since that pedal is a favorite among Gilmourish Muff enthusiasts, and reviewed above, I thought I would examine and compare the two. Noise - Noise level is practically identical. The P-2 is a bit noisier but not by much. Crank the sustain to max and the Beaver is definitely the quietest. That is likely because the buffer in the P-2 adds some gain to an already noisy Muff circuit, which is just noisy by nature. No buffer in the Beaver = less noise. Not a lot of difference here though. 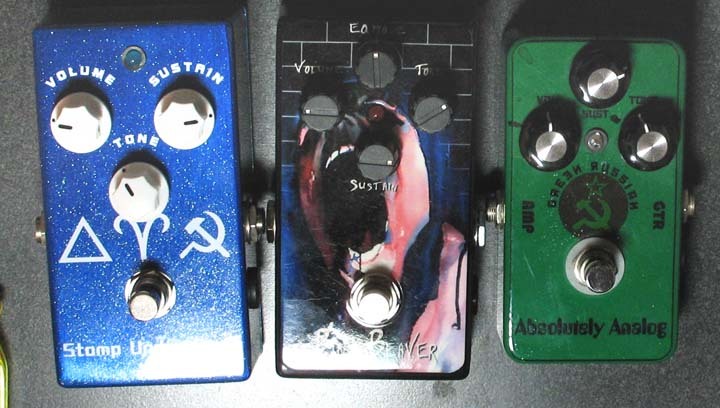 Sound - These pedals do not sound identical, but in the David Gilmour tone range they are pretty darn close when the Beaver is in mids position 1. Here are the differences. a. The Beaver has a four position EQ knob - scooped, flat mids, boosted mids, and a tone circuit bypass setting. The Beaver wins in the versatility area over the P-2, but the P-2 tone circuit is more usable than a standard Big Muff in that turning the knob fully clockwise still gives usable tones, rather than the typical harsh trebly tone. b. The P-2 has more mids and a slight bit less bottom end than the Beaver when the Beaver is in stock EQ positon. Switch the Beaver to mids position 1 and they are almost identical, but the P-2 still sounds a bit sweeter. c. In the extreme tone ranges (1 or 10 tone knob positions) the P-2 has more usable sounds than the Beaver does in EQ position 1 or 2.
d. Both clean up about the same at low guitar volumes. e. When you go brighter on the P-2 tone and max the sustain it is more nasaly sounding than the Beaver , which I like. The Beaver is a bit fatter sounding, like a typical Ram's Head. f. Clarity of notes and cut through in a band mix is very close, but the P-2 is slightly better in this area than the Beaver Ram's Head. Compared to my Beaver Triangle Muff spec it is about the same. g. The P2 seems very uniform and consistant in its tone. The Beaver seems to have a bit more wildness to it, more organic. Buffer - The P-2 has a class A buffer preamp that helps clean up and brighten anything else that comes after it in the signal chain. It keeps your signal steady and drives it through other bypassed pedals that follow it in the signal chain with an output buffer that keeps the signal from dropping. It also means you may have to adjust all your gear settings if you don't want everything sounding brighter, but that's not a big deal if it stays on your pedal board, and if you have a lot of pedals in your chain, this pedal will definitely improve the fidelity of your sound, even when off. There is no buffer in the Beaver . True Bypass - Beaver is true bypass, P-2 is unity gain buffered in bypass mode. Both have a cast aluminum box. Foot switches are about the same. I like the jacks much better on the P-2, but I think both will hold up for a very long time. Knob pots are better on P-2. The P-2 circuit is not accessible without going through some hoops to get it open and voiding your warranty, and it is covered in red goop to protect it from moisture/shock damage (mine had already been opened by the previous owner). But Pete will fix it if it breaks. The Beaver is user accessible with schematics online, and releatively easy easy to replace components. I don't see any big difference in circuit board component quality, though Pete Cornish uses slightly higher quality components than what you will find in a Beaver. Both have standard DC power jacks. You have to take the back off the Beaver to change the battery. P-2 has a cool little pop out tray on the side. You don't even have to plug it in. Just drop it in the tray and close it. The P-2 takes up about 4x the space on a pedal board as the BYOC and costs 4 to 8 times as much as the BYOC. The P-2 is sort of the Ferrari of Big Muffs, so you are paying for the rugged enclosure, pcb build quality, better daylight LED, improved power supply, and buffering system. This pedal is expensive, but built for the touring musician and will last a very long time. If you are on an extreme budget, the BYOC is the way to go for a very similar tone. P-2 Sound Clip - Pink Floyd's Comfortably Numb solo. Fender Strat with Boss CE-2 chorus and TC Nova delay into a Twin Reverb. P-2 Sound Clip #2 - Intro to Sorrow with P-2, Boss CS-2, Tube Driver boost, Boss CE-5, and TC Nova delay. EMG DG-20 Strat into Twin Reverb. See this page for more P-2 sound clips. Here are clips comparing the P-2 to some other popular Muff clones. Strat with Seymour Duncan SSL-5 bridge pickup into a clean Fender Twin Reverb. Pedal settings shown below. Comparison Demo for Leads - Comparing (in this order) P-2, BYOC Beaver, Musket, and Pig Mine. Black Strat and Fender Twin. I had a Boss CE5 chorus and DD2 delay on. Comparison Demo for Note Clarity - Here is the same, but comparing the clarity of individual notes with a slightly dirty boost. First is a light boost for each pedal, then a dirty boost. Another Comparison Demo - In this order: P-2, BYOC Ram's Head spec with mids position 1, V2/Ram's Head Big Muff, Civil War Sovtek Big Muff. I turn the guitar volume down at end to show how each cleans up. 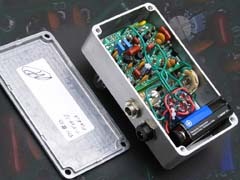 Skreddy Pedals P19 - The Skreddy Pedals line of hand made fuzz boxes are filled with a history of custom tuned Big Muff style pedals, hand built by Marc Ahlfs in California. Beginning with the Skreddy Maynonnaise, which was a straight clone of a particular triangle era Big Muff, the Muffs that followed it were tuned around the sounds of anything from the Smashing Pumpkins to Ernie Isley's Big Muff tones, and even a few designed around David Gilmour's Big Muff tones. One thing about the Skreddy line is that Marc is never satisfied just doing the exact same circuit for more that a few years. When NOS transistors became scarce the Skreddy muff variants became scarce, with the occasional Mark II version of some discontinued pedals appearing here and there when small batches of NOS transistors were acquired again. After an absence of a permanent muff in the line Marc decided to try one using modern parts in 2008, which became the Pig Mine. Now that pedal has had its run and Marc retired it in 2011. The P19 was designed as its replacement (look at it just right and P19 reads like Pig). Marc decided to build a less gainy version of the Pig Mine, with more bottom end, less mid range, less noise, and a bit of Pete Cornish inspiration thrown in for good luck. The P19 tone is still on the bright mids side like the Pig Mine, but not as extreme. It has a really nice balance between mid range and bottom end. It's not too fuzzed out or flabby at all on low notes, like you find with some of the more scooped and bassy Big Muffs. Overall the P19 blends a vintage Ram's Head Big Muff tone with the mid range and articulation of a Sovtek Big Muff, but with much less bottom end than either. It still has that unique compressed sound most of the Skreddy muffs have, but this one actually works well when blending with overdrive boosters or a compressor, whereas many of the earlier Skreddy muffs worked better as stand alone pedals. As with most Skreddy muffs, the articulate mid range means this will not get lost in a band mix like a typical Big Muff can. It has a great tone for leads and power chords. It handles those Pink Floyd The Wall era Big Muff tones nicely - In the Flesh, Young Lust, Mother - but with a tad less bottom end than Gilmour's tone. 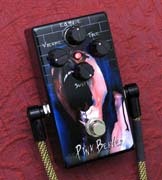 This pedal should not be considered a Pink Floyd pedal however. It can do anything from classic rock to modern. This is definitley nothing like the more "doomy" boutique muffs with monster lows or over the top sustain, but it can handle some of that Pumpkins and Queens of the Stone Age material just fine. The maximum distortion is less than the Pink Flesh and Pig Mine, but this still has plenty of distortion on tap, and letting it feedback at really high volume is a sweet sound. It is more in line with the Sovtek Big Muffs as far as the amount of distortion available. With the sustain dialed back and tone dialed up it does a nice dirty rhythm tone, and with the sustain below noon the tone is still quite usable. Muffs do not typically clean up nicely when backing the guitar volume down like a good fuzz face or overdrive pedal does, but this one does far better than a typical Big Muff on low sustain cleanup. A standard feature on Skreddy muffs is the tone selector switch, which allows you to switch between "flat" and "hump" positions, with flat having slightly less range than hump position. The switch punches the mids up in "hump" position quite a bit, more so than previous Skreddy muffs I have played. The flat position works just fine with my gear and sounds most balanced to me at high volume. When playing at low bedroom volumes switchng to hump position really adds clarity to the tone, and if you are getting lost in a band mix (which I would find hard to believe with this pedal), that boost helps separate you from the other instruments. I rarely play at low volume, so I would have been happy with a mids scoop switch rather than a boost, but it is still a very usefull thing to have for most players. 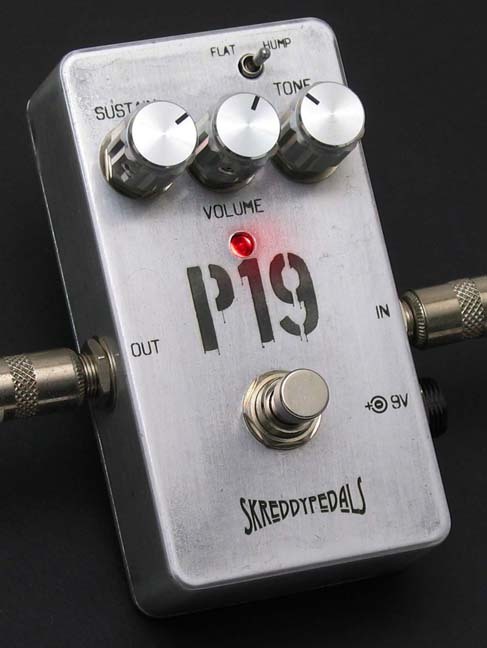 As indicated by the name and the stencil font used, the P19 was inspired somewhat by the Pete Cornish P1 and P2 modified Big Muff circuits, but this is not a clone of either one. In fact, Marc said he has never actually played either, but looked at the circuit traces of both for ideas, then went in his own direction from that. As far as how it compares to the actual P1 and P2, since I have both I gave them a side-by-side demo. The P19 is nothing like a P-1, but it does have similarities to the P2. The P1 is much more mids scooped than the P19 and has a bigger sound with more bottom end, just like a good Ram's Head Big Muff. The P2 has even more bottom end than the P1, and much more than the P19, but the P19 has tighter control of the lows than the P2, meaning, you don't have to use your thumb as much when picking the lows to get that harmonic punch. The reduced lows don't give it quite the same BIG sound that the P2 has, but in a band mix it is able to stand out more than the P2. The mid range tone of the P19 is where it is really similar to the P2. It is almost the same in that area. Examining the noise floor, this one does have less gain/sustain than the Pig Mine and Pink Flesh, so it is quieter than those. Marc said he worked to try and reduce the noise as much as possible. Noise is slightly less than average for a muff in a similar gain range. Considering the Pink Flesh and Pig Mine are on the noisy side when the sustain is dailed high, this is an improvement. The P19 comes in the same small MXR sized enclosure like the previous Skreddy muffs, with a rough brushed aluminum finish and a Cornish inspired logo font. The circuit features BC183C and BC184C transistors, carbon comp resistors, ceramic and film caps, and Marc's special clipping diode mix. Runs on a 9v battery or standard Boss AC converter. The cost on the Skreddy website was $195 at the time I purchased mine in 2012. These clips are with the mids switch set to flat and the tone around 10:30. Sustain was around 75%. Fender Strat into a Fender Twin Reverb and Reeves C50. Sound Clip #1 - Some chords and riffs. Not dark enough for some of the stuff I play here, but gives you an idea of what it can do. Sound Clip #2 - Pink Floyd's Mother solo. P19 and delay. Sound Clip #4 - Pink Floyd's Young Lust solo. P19 with Boss CE-2 chorus and Electric Mistress in a blend looper set at 75%. TC Nova delay. Sound Clip #5 - Same solo, but this time I just used the Electric Mistress straight in the signal chain, no chorus. TC Nova delay. Sound Clip #6 - Intro to Pink Floyd's Sorrow. My EMG Strat needed to be restrung, so this is the SSL-5 bridge pickup on my black Strat. Missing something without the EMG SPC control, but you get the idea. It has a sweet feedback. P19, Boss CS2, Tube Driver boost, Boss CE2, Boss RT-20 in L channel. TC Nova delay. Sound Clip #7 - P19 vs Pete Cornish P2. For each riff, P19 first, then P2. The primary difference is that the P2 has more bottom end. Souned Clip #8 - Pink Floyd's Young Lust riff, comparing P19 to Pete Cornish P2 and P1 (in that order). Harder to hear the differences on low notes, so listen loud, but the P19 has no flab at all. The mids scoop is almost identical to the P2. Sound Clip #9 - Pink Floyd's In the Flesh riff. Same setup as above. Skreddy Pedals Pink Flesh - A modified Big Muff circuit by Marc Ahlfs of Skreddy Pedals that is based on the Triangle Big Muff, but tuned to give you something like David Gilmour's boosted Ram's Head Big Muff tone from Pink Floyd's The Wall era, with an input capacitor to give a more saturated sound like the "Ram's Head" Big Muff. Marc's Muffs have a unique sound you cannot get with a standard Big Muff. They work as stand alone units, where most Muffs used for Gilmour tones sound better when combined with a booster, compression, or EQ. The Pink Flesh sound is thick, compressed, and creamy, like a Big Muff with some overdrive and compression added, with much more midrange than an old Triangle or Ram's Head Muff. The PM has less bottom end, so it does have that BIG scooped sound you get from a vintage Big Muff by itself, but it works in a band mix really well because it won't get lost with the bottom end bass guitar. There is a Flat/Juicy switch that allows for the Pink Flesh to go from "flat mids " to "mid hump" as opposed to typical scooped Big Muff mids. Both settings are much less mids scooped than a vintage Ram's Head or Triangle Big Muff. It has more gain than a typical Muff, but also much more noise at high gain settings. Overall, this is a great pedal for Gilmour tones, but it is more of a mix of the mids heavy Pulse era Gilmour Big Muff tones and the Wall era. More of a modern sound to me, but very unique. Made with NOS parts, including vintage 2N5033 transistors and one BC109c transistor. Sadly, this pedal is no longer made due to the scarcity of the out of production transistors. You can find them on ebay occasionally, but at rediculously inflated prices. They were selling at $600 and over on ebay at the time I wrote this review in 2006. Pink Flesh sound clip 2 - Pink Floyd's Comfortably Numb solo. Juicy switch position, 50% sustain. Fender Strat with Boss CE-2 chorus and TC Nova delay. Skreddy Pedals Pig Mine - Another modified Big Muff circuit by Marc Ahlfs of Skreddy Pedals that was designed to fill the void left in his line when he discontinued the Pink Flesh. Marc says he tuned this one to have the sound of the solos in Dogs, from Pink Floyd's Animals album. It is made from all modern parts but Marc has made it sound amazingly close to the sound of his Pink Flesh. I don't know if it is any closer to David Gilmour's tone on Animals than a vintage Muff is. For the Animals recording sessions David had his BC108 Fuzz Face, a Pete Cornish custom fuzz, and a Colorsound PowerBoost overdrive. These solos were likely just the Muff, though the live performances of this materila in 1977 sound like the Power Boost was running behing the Muff. Gilmour may or may not have used a real Big Muff in the studio for these solos at the time, but since the Cornish custom fuzz was almost an exact clone of a Big Muff circuit it would have been hard to tell them apart. The custom fuzz was later renamed the the P-1 and sold in pedal form, reviewed above. David did use a Ram's Head Big Muff during the Animals tour, along with the Fuzz Face and Colorsound. A stock Big Muff will not give you exactly those same tones heard on the studio recording however. There was modulation from rotating speaker cabinets, artificial double tracking, and other things done in the studio to give it that unique tone. The Pig Mine is a great sounding pedal, very similar to the Pink Flesh described above, and very different from a stock Ram's Head Big Muff tone. It is much brighter, with more mids. Compared to the Pink Flesh, it has more dirt in the tone, and sounds better at mid to low gain than the Pink flesh. Very smooth, articulate and versatile. Very much that unique Skreddy mids-heavy Big Muff sound. It cuts through in a band mix more easily than a vintage mids scooped Big Muff. The PM is great for Pink Floyd's Animals/The Wall era tones, but also a very versatile pedal for other music. It has more gain than a typical Muff, but it abit noisier too. It does have less less noise at high gain than the Pink Flesh and some of Marc's earlier Muffs. Features a Lean/Fat switch for added mids similar to the Skreddy Pink Flesh, but this switch has more effect than the Pink Flesh switch. The cost was about $195 at the time I purchased mine in 2008. Pig Mine sound clip 1 - Pink Floyd's Comfortably Numb solo. Lean switch position, 50% sustain. Fender Strat with Boss CE-2 chorus and TC Nova delay, into a Twin Reverb. Pig Mine sound clip 2 - Same as above but with fat switch on. Pig Mine sound clip 3 - "wet" sound with chorus and delay. Fat switch position, sustain 75%. Fender Strat with Boss CE-5 chorus and MXR Carbon Copy delay, into a Twin Reverb. Pig Mine sound clip 9 - Cherub Rock - Les Paul played through a Marshall JCM800. Not as meaty and low end toned as a V4 Big Muff for this Smashing Pumpkins tone, but it still works nicely. Website and contents ©2007, ©2010, 2011Kit Rae. All rights reserved. Linking to this website is allowed, but copying the text content is strictly prohibited without prior authorization. No part of this work may be reproduced, stored in a retrieval system, or transmitted in any other form, or by any means, electronic, mechanical, photocopying, recording, computer networking, or otherwise without prior permission in writing from the copyright holder(s).